Gravy Soup 23 The night before you want your soup, put three pounds of lean beef into a Saucepan, with a gallon of water, in the morning place it over the fire to stir slowly with a large bunch sweet herbs, some carrots, turneps an onion, or two, and a Leek. season it with whole pepper, cayenne, and some salt, when the parts done, strain it off clear, having from time to time carefully taken off every bit of fat. 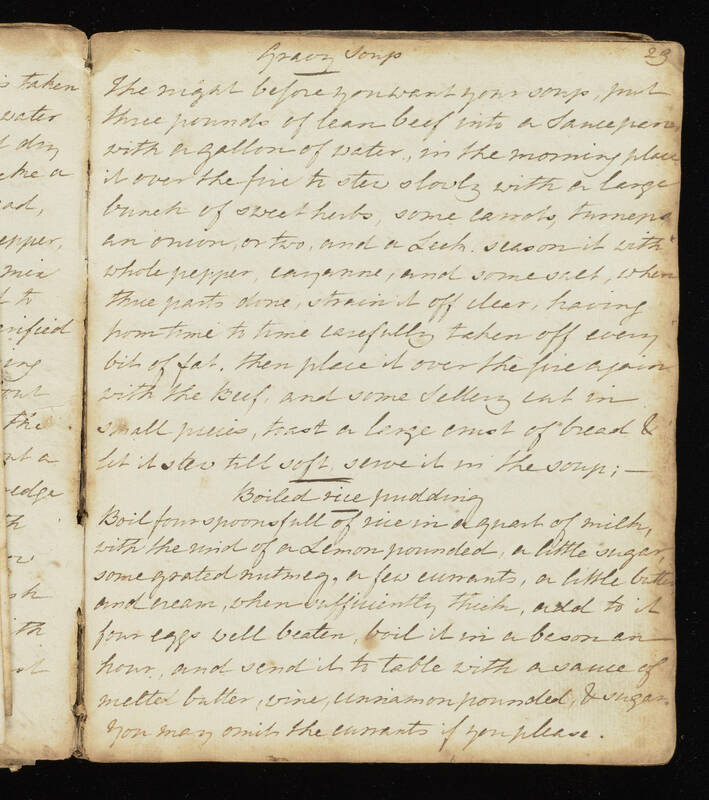 then place it over the fire again with the Beef, and some Sellery cut in small pieces, toast a large crust of bread & let it stew till soft, serve it in the soup; Boiled rice pudding Boil four spoonsfull of rice in a quart of milk, with the rind of a Lemon pounded, a little sugar, some grated nutmeg, a few currants, a little butter and cream, when sufficiently thick, add to it four eggs well beaten, boil it in a bason an hour, and send it to table with a sauce of melted butter, wine, cinnamon pounded, & sugar You may omit the currants if you please.